Large building and wide apartments in Madrid centre. 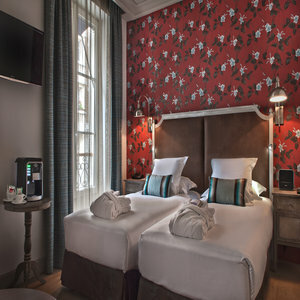 The Eurobuilding Aparthotel offers large and elegant flats in the centre of Madrid. All the reservations have room service, background music, air conditioning, digital TV, full kitchen with kitchenware. Moreover, this aparthotel offers all the normal hotel servicies. In its restaurant "SerpentÃ­n", years of experience guarantee the quality of its home-made and Mediterranean couisine. Some of its facilities are car park, shops and outdoors swimming pool. The Eurobuilding is situated next to Paseo de la Castellana, Castilla Square, one step from the Congress Palace and Santiago Bernabeu Stadium. It also has an exellent connection red to the Madrid Trade Fairs (IFEMA and Juan Carlos I). A perfect place both for usual tourists and for business people. Notice: In the rooms with 2 adults + kid of less than 10 years old, the children's bed is a sofa-bed.